You can see the couch in the left lower corner here. The couch is where my husband likes to hang out, playing the Playstation or reading. We like being in the same room even if we’re not doing the same thing so this arrangement is perfect for us. Please excuse the undressed dressform. Maybe I could make a robe or something for her to wear in between projects. And matching covers for the sewing machine and serger, maybe? 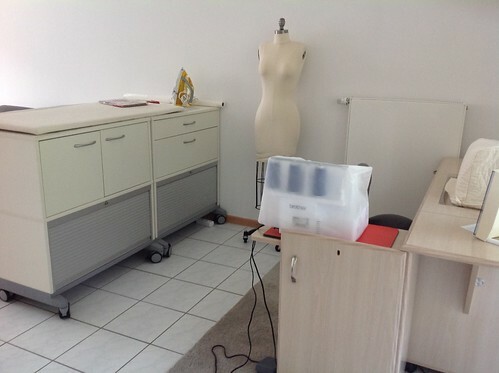 The coverstitch machine is now living behind the doors of the cabinet on the left. I just need to buy a 110V surge protector before I can use it. (The other machines run happily on 220V.) The two compartments with gray roll-doors hold fabric. Maybe about 25% of my collection. The rest is upstairs, neatly stacked on shelves in the storage room. My little bit of sewing-related decoration – it used to belong to my grandmother. Both the treadle and the needlepoint cover. I added the decorative things on top. Pretty cool, eh? This entry was posted in sewing space. Bookmark the permalink. Congratulations on your move! 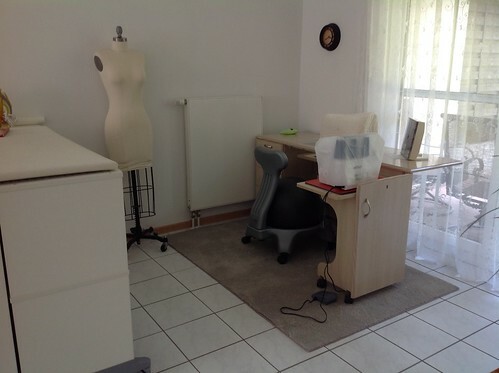 Very nice sewing space. 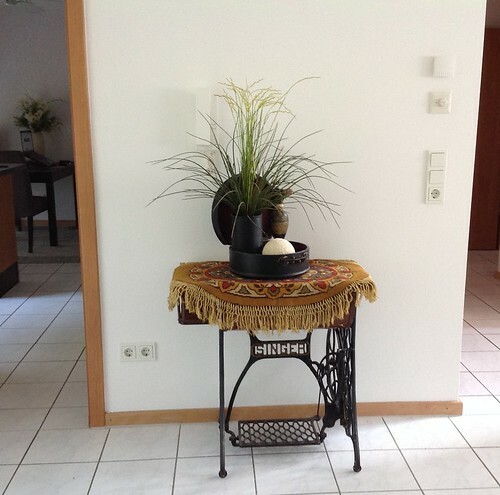 I, too, have a treadle machine gracing my front entry. 🙂 My great-grandmother’s. I love your new set up, it looks so efficient. I didn’t know you had moved, where are you now? Thank you, ladies! Gari, it was a local move, from an off-base rental to base housing. Still in Germany. 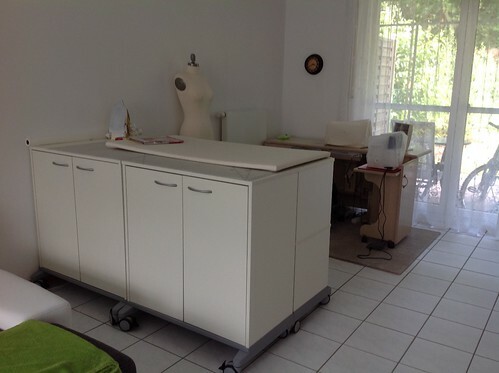 Love your sewing space and especially the cutting table. The wheelbars supporting it are remarkable. Do you have a link where they are sold? Thanks! Thank you, Kate! I don’t have a link but the whole cutting table is four office storage units from IKEA and the casters were one of the options. I bought the whole setup back in 2007 and don’t see it on their website anymore. Love your sewing room! Where did you get the chair? Does it use an exercise ball?